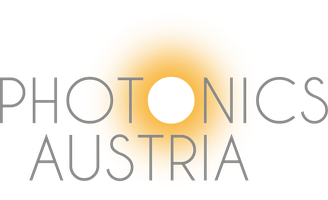 Quantum Cryptography made in Austria - photonics-austrias Webseite! An Austrian research effort paves the way for seamless integration of Quantum Cryptography (QKD) into existing classical communication networks. The collaboration, existing of AIT – Austrian Institute of Technology, TU Vienna and the IT company Bechtle Austria (formerly Sitexs-Databusiness IT-Solutions) demonstrated an actual integration of a data link secured by Quantum Cryptography inside a classical DWDM network. During the FFG found project “QKD-Telco”, the researchers built a QKD prototype that creates secure keys between two communication parties. The novelty of the system is that all communication traffic (quantum and classical signal) is sent over a single optical fiber only. Quantum Cryptography, based on the laws of quantum mechanics, offers the possibility of information theoretical security. By distributing entangled photon pairs, a secure key can be established between two parties by simply measuring the polarization state of the photons and calculating their correlations. Besides a quantum channel for the single photons, a classical communication channel is also needed for post processing routines such as error correction and authentication of the key. An optical fiber in a telecommunication network carries typically many tens of classical channels causing a broadband emission of Raman scattered photons. If the quantum channel is also combined on the same fiber, the scattering would considerably disturb the weak signal. Therefore, the quantum and other classical channels were so far always physically separated to avoid cross talk. This necessity of a “dark” fiber, exclusively used by the quantum channel, poses however a prohibitive cost and remains an obstacle to a wider roll-out of quantum cryptography. By moving the quantum channel into the O-band region at around 1300 nm and employing tight spectral filters, the integrity of the quantum signal could be preserved even in the presence of strong classical channels. 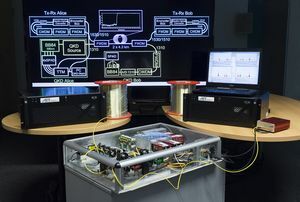 The system consists of an entanglement source which wavelength multiplexes the single photons onto an optical fiber connecting the two communication parties. The polarization states of the photons are measured on both sides and the results are then further processed inside two encryption boxes. In this way a secure key could be established for the first time in fiber links up to 15km length in the presence of other classical channels using polarization entangled photon pairs. The generated key was then used directly by the encryption devices for encryption protocols such as one-time-pad or AES cipher.